We, the coalition of faith, labor and community groups that have led the fight for a $15 minimum wage in Saint Paul for more than a year, oppose the amendment brought by Councilmember Thao at the first reading of the minimum wage ordinance on October 17th. 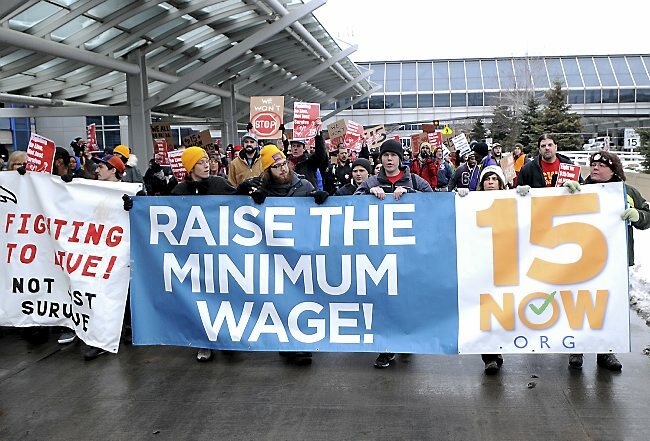 The fight for a $15 minimum wage in Saint Paul began four years ago when workers went on strike demanding livable wages to address the crisis of poverty and inequality in our city. Since then, the crisis has only intensified. Thousands of families struggle to pay rent and make ends meet while working multiple jobs. The burdens of rent, bills, transportation, and childcare continue to rise while wages stagnate far below cost of living. With 1 in 4 jobs in the city paying below $15/hour, it’s no wonder that nearly 40% of Saint Paul lives in poverty. Workers need raises as soon as possible. City Hall has spent the past year deliberating and designing a policy that is right for Saint Paul. The current ordinance language means workers must wait another 18 months for the first raise on the way to $15. After so much time, and with the crisis of poverty growing every day, it’s essential that the raises are as large as possible as soon as possible. The current ordinance language already puts workers at microbusinesses at a significant disadvantage, with a full-time worker at a microbusiness making $18,464.29 less than their counterparts at small business over the eight-year implementation period, or $200/month less on average. The proposed amendment doubles these numbers, meaning workers at microbusinesses will earn almost $40,000 less than workers at small businesses over the eight-year implementation period. Workers at small businesses would earn $11,481.60 less over the period of implementation, on average a loss of $160/month for six years. The numbers proposed in the amendment are not minor adjustments to a phase-in schedule, they are major losses for working families struggling to pay bills and put food on the table. Furthermore, the proposed amendment does not get to a $15 wage in the same time frame. In fact, it eliminates the $15 wage step for both small and micro businesses, meaning workers will wait an extra year to earn more than $15. In addition, by eliminating the $15 wage step, small and micro businesses will face huge wage increases when they jump from $14 to the City Minimum Wage that has been increasing with inflation. In 2026 for small and 2028 for micro, the wage will likely increase by over $2 in a single year. This enormous one-time jump will make is difficult for businesses to comply and will create significant political pressure to reverse the minimum wage law at the city or state level. The current ordinance language is the product of years of workers and community organizing for a $15 minimum wage. Saint Paul residents have made it clear at the ballot box and in the streets that we want a $15 minimum wage for every worker as soon as possible, and the phase-in proposed in the ordinance meets those needs. Much like enforcement, phase-in schedules are an often overlooked but critical component of an effective policy for raising wages. The longer Saint Paul’s $15 minimum wage policy delays raises, the less effective it is at the goal of lifting working families out of poverty. City Hall’s current ordinance will give working families sizeable raises at a pace that accommodates the needs of small businesses. We urge the City Council to reject this amendment and move forward with a $15 minimum wage with no tip penalty and strong enforcement to give workers their much-needed raises as soon as possible.